PITTSBURGH -- It was baseball's own "clash of the titans." 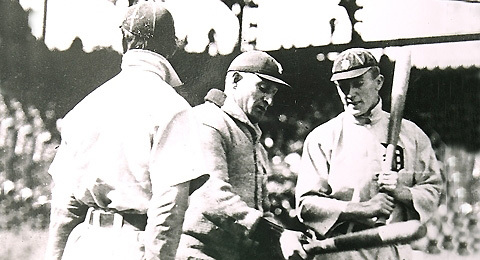 Pittsburgh's Honus Wagner, then 35, and Detroit's Ty Cobb, just 22, faced off on the field for the first and only time in their historic careers during the 1909 World Series. But it would be rookie pitcher Babe Adams who stole the show as the Pirates won their first World Series title by beating the Tigers in seven games. "They were considered the best players in their leagues at the time," Major League Baseball expert and author Ray Zardetto said of Wagner and Cobb. "That was the dead-ball era, so the fans tend to revere batting champions the way we revere the home run champions." The number of batting titles entering the 1909 Series? Wagner had seven and Cobb, three. But it was Adams, a 12-game winner with a 1.11 ERA in the regular season, who baffled Tigers hitters to win three games in the Series. His postseason success in 1909 was a harbinger of what was to come as he finished his career with 194 wins. He walked only 430 batters in his 19-year career, an average of just under 23 per season. He shares the franchise record for victories by a right-hander with Sam Leever, who pitched with the club from 1898-1910. "The idea of throwing the unexpected had real merits then and I believe still does," baseball author and expert John Thorn said. "But Adams went on to a great career. Not fabulous stuff, but unusual control." This weekend, the Pirates honor the 100-year anniversary of that first World Series championship with a handful of events as the Tigers return to Pittsburgh for Interleague Play. The commemoration includes a pregame ceremony with former Pirates champions Bill Mazeroski and Steve Blass, among others. On Sunday, the Pirates will "Turn Back the Clock" by having both clubs wear its 1909 uniforms. PNC Park will try to replicate the 1909 game experience fans had at the time with a retro scoreboard and no music or mascots. In the 1909 Series, the teams exchanged wins throughout, with Wagner and Adams leading the Bucs. Pirates left fielder/manager Fred Clarke, who hit just .211 during the Series but posted a series-high seven RBIs, selected Adams to start Game 1. A little more than a week later, Adams finished the Series with a 3-0 record and a 1.33 ERA. He saved his best for last as the first World Series to go to a deciding Game 7 saw Adams throw a shutout to clinch the Series in an 8-0 Pirates victory. It was the first time a rookie started and won Game 7. Only the Angels' John Lackey in 2002 has repeated the feat. All the more impressive was that Adams did this against what Zardetto said was widely viewed as the American League's premier offense that season. The Tigers led the American League in runs per game that season (4.2) during the heart of the dead-ball era. While the Wagner-Cobb opposition certainly stands out, only Wagner put up consistent numbers in the Series. He hit .333, stole six bases and added 6 RBIs. Cobb hit just .231. It would be the last time Cobb, who stole home in Game 2, played in a World Series. The defeat also meant the Tigers were the first team to lose three straight World Series. Although the 1909 World Series didn't have the "mano-a-mano" statistical contest -- as Thorn called it -- much attention still focused on the supposed animosity between the two future Hall of Famers. Zardetto surmised that such hostility probably stemmed from Cobb's ornery behavior on the diamond, all part of his goal to get under opponents' skin. One story had Cobb calling Wagner a "Krauthead" because of his German ancestry. In an attempt to steal second, Cobb was tagged in the mouth by Wagner, who drew blood from Cobb's lip. However, box scores of Game 4, which was the only time Cobb was charged with a caught stealing in the Series, show such a play never happened. And Cobb was actually safe thanks to an error. "When I was younger, I was still in zeal to correct misstatement of fact," Thorn said. "As I've gotten older, I've come to respect the legend and the lore." Zardetto added, with a laugh, that it doesn't really matter if such a play happened with Cobb and Wagner because "baseball lore said" it did. Much like the story around Babe Ruth's alleged called shot in the 1932 World Series, this story has grown in time. In later years, the relationship mellowed between the two. In fact, Cobb is quoted as calling Wagner "maybe the greatest star ever to take the diamond." Although media and fan attention during the 1909 Series remained fixated on the "clash of the titans" it was in fact Adams, a farm boy from Indiana who helped lead the Bucs to their first World Series championship. And if that wasn't enough, he did this despite changing into a righty during childhood. "He was born a left-handed thrower and had a bad accident as a kid," Zardetto said of Adams, who almost had a finger severed off. "He learned to throw right-handed. He became one of the great control pitchers of all-time. He hit them at a time when the Tigers weren't ready for what he had to show." Wayne Staats is an associate reporter for MLB.com. This story was not subject to the approval of Major League Baseball or its clubs.